This piece first appeared as a study attached to an article in the Connecticut Mirror by SE Coast’s Gregory Stroud. Fresh off the election, Connecticut Governor Ned Lamont has proposed an ambitious infrastructure plan, dubbed 30-30-30, in which train travel between New York and Stamford, Stamford and New Haven, and New Haven and Hartford would be cut to 30 minutes. 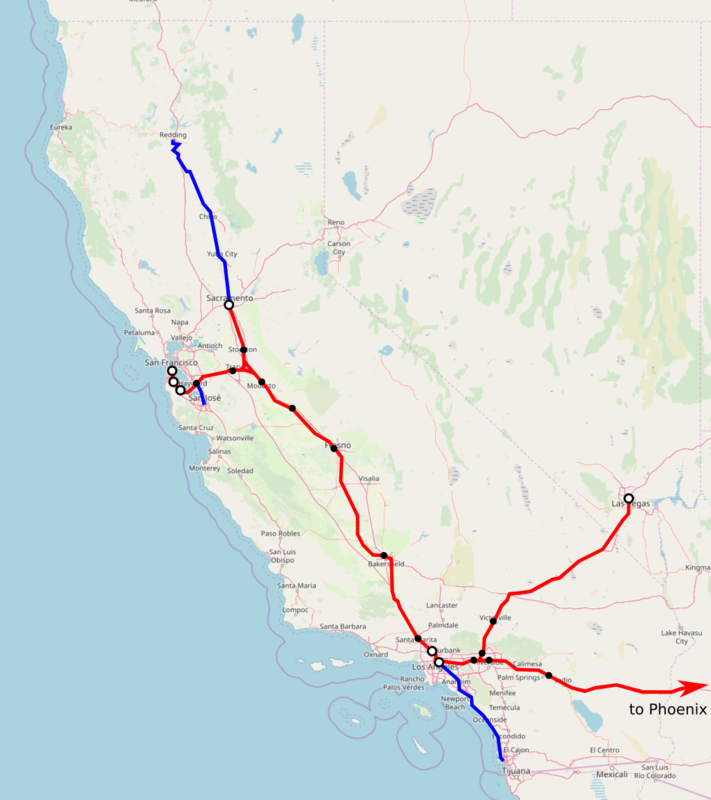 With an average speed of about 110 km/h, this is only about half the average speed typical of high-speed rail, but still slightly higher than that of the Northeast Regional between New York and Washington, which is competitive with cars and buses provided there is enough capacity. For 30-30-30 to truly be cost-effective, the plan needs to speed up trains with relatively little infrastructure investment, at a cost measured in hundreds of millions of dollars. Is that feasible? The topline answer is yes. All three segments can be done in the specified amount of time. North of New Haven, there are generous margins, but 30-minute travel times will rely on electrifying the Shuttle and running high-quality electric trains. South of New Haven, each segment has just seconds to spare to achieve the governor’s goal, and no big-ticket capital investment would be needed, but the plan will require a complete overhaul in Metro-North operations. Some additional repairs are needed on tracks straight enough to allow trains to run at 160 km/h, which are today only maintained to allow 75 mph, or 120 km/h. The state may also need to procure lighter trains, able to accelerate faster than the current equipment. On a fast schedule, with few intermediate stops, the difference with the current M8 trains is small, but in practice north of Stamford, where trains are likely to make many stops, the difference would be noticeable. Most of all, reliability must improve enough that is possible to remove the extensive schedule padding in the timetable today. Metro-North is in a perpetual maintenance cycle. At any time there is a slow zone somewhere on the tracks, with generous schedule padding on top of it. Maintenance must be switched to the nighttime, as is practiced on high-speed lines in Japan and France and on subways everywhere in the world outside New York, in order to improve daytime reliability. In order to figure out the best possible trip times, I made a table of speed zones on the New Haven Line, from Grand Central to New Haven. But instead of using current speed zones, which are very conservative, I looked for the maximum speed that is feasible within the current right-of-way. The most important rule I followed is no curve modifications, even modifications that are likely to happen under any high-speed rail scenario. While some capital investment may still be required, it is entirely within existing rights-of-way. In the simulation, I used code outputting slow penalties for trains based on prescribed performance characteristics. For this, I used two sets of characteristics. The first, is for the M8 trains used by Metro-North today. The second is an average of modern European regional trains, such as the Stadler FLIRT, the Alstom Coradia, the Bombardier Talent 2, the CAF Civity, and the Siemens Mireo. Because they are much lighter-weight, all have about 50% better acceleration than the M8 at any speed. Both sets of trains can reach the same top speed, 160 km/h, but when the M8 slows down from top speed to make a station stop, the extra acceleration and deceleration time add another 69 seconds to the trip, compared with only 46 seconds on the European regional trains. That said, the proposed schedule has few intermediate stops, and even with frequent slowdowns due to curves, the total difference in time between the two sets of trains is about two minutes. So, while I would urge Connecticut to buy modern trains at its next procurement, based on the latest revision in FRA regulations permitting lightly-modified European trains, the present-day rolling stock is good enough, it’s just much heavier than it needs to be. While I did not assume any curve modifications, I did assume that trains could run faster on curves than they do today. The New Haven Line has conservative values for the permitted centrifugal force acting on trains. I explain more about this in a previous post about trains in Connecticut, but the relevant figures are about 8” of total equivalent cant on the New Haven Line today, or about 200 mm, whereas light trackwork increasing total cant and already-existing regulatory changes above the rails could raise this to 12” on existing trains, about 300 mm, and even more on tilting trains like the Acela. The difference between 200 and 300 mm of total equivalent cant corresponds to a 22% increase in speed; the formula is . Moreover, in some areas the maximum speeds are even lower than one might assume based on curve radius and current permitted curve speeds. These include the movable bridges over the waterways, which have very low speed limits even when the tracks are mostly straight; if the bridges physically cannot accommodate faster trains then they should be replaced, a capital investment already on the state and the region’s official wishlist. In addition to speed limits imposed by curves and bridges, there is a uniform speed limit of 90 mph (145 km/h) on the New York segment of the line and 75 mph on the Connecticut segment. This is entirely a matter of poor maintenance: the right-of-way geometry could support higher speed today in some places, even without curve modifications. Finally, trains today go at excruciatingly slow speed in the throat heading into the bumper tracks at Grand Central, 10 miles per hour. This is bad practice: even with bumper tracks, German train throats with complex switches are capable of 70 km/h. This change alone would save about 4 minutes. Overall, trains today are scheduled to take about 11-12 minutes between Grand Central and Harlem, and the proposed schedule cuts this down to 5-6. I am attaching a spreadsheet with exact speed zones, rounded down in 5 km/h increments. People who wish to see what’s behind the timetable I’m proposing can go look there for intermediate times. These may be especially useful to people who want to see what happens if more stops on the Lower New Haven Line are included. For example, one might notice that all technical travel times are padded 7%, as is standard practice in Switzerland, and that trains dwell exactly 30 seconds at each station, which is observed on busy commuter lines in Zurich as well as Paris. I am including two stopping patterns: regional and intercity. Regional trains make the same stops as the Upper New Haven Line trains do today, plus New Rochelle. Intercity trains only make a few stops beyond Stamford, with a stopping pattern close to that of Amtrak. In addition, I am including two different sets of rolling stock: the current M8, and lighter, faster-accelerating European trainsets. The difference in the regional train pattern is noticeable, while that in the intercity one is less so. Finally, at stations, it’s possible to state the scheduled the time the train arrives at the station or the one it departs. At all intermediate stations, the timetable below states the arrival time, unlike the attached spreadsheet, which uses departure times to permit calculating exact average speeds. In theory, achieving the governor’s proposed timetable is easier north of New Haven. The Hartford Line is a straight route. Most of it has a top speed of 80 mph, and outside the approaches to New Haven and Hartford, the speed restrictions are caused by arbitrarily slowdowns for grade crossings rather than by constrained geometry. However, in practice, the line is in poor state of repair. Grade crossings are unprotected. The entire line is not electrified, and there are no plans to electrify it, for reasons that can only be explained as an allergy that North American railroaders have to electrification. The stations have low platforms, which are not accessible to people in wheelchairs without labor-intensive, time-consuming lift operations—and even if there are no riders with disabilities, it just takes longer for passengers to board from low platforms. The above schedule assumes 7% padding and 30-second dwell times at stations, but such assumptions only work when the equipment is reliable, and when there are wide doors letting passengers on the train with level boarding or at worst short steps. Traditional commuter lines pulled by diesel locomotives, serving low-platform stations with narrow doors, have to be much slower. Clem Tillier‘s example timetable for Caltrain requires 15% padding and 45-second dwell times with today’s diesel operations—and at rush hour some station dwells stretch over minutes due to the railroad’s uniquely high number of passengers with bicycles. The good news is that electrification and high platforms are, in the grand scheme of things, cheap. Amtrak electrified the Northeast Corridor between New Haven and Boston at $3.5 million per kilometer in the 1990s, adjusted for inflation; at that cost, wiring the entire New Haven-Springfield shuttle would run up to $350 million. Moreover, Boston has been equipping a number of commuter rail stations with high platforms in order to provide wheelchair accessibility, and in ordinary circumstances, the costs have been on the order of $6-10 million per station. This entire package on the Hartford Line would be cheaper than replacing any of the movable bridges on the New Haven Line. Moreover, upgrading grade crossings with four-quadrant gates, which make it impossible for cars to drive around the gates while they are closed, is affordable as well—and would permit the towns along the route to institute quiet zones, eliminating the loud train horns. In Boulder, the same installation costs about $500,000 per grade crossing for quad gates and another $300,000 for an alternative to horns; in federal regulations, quad gates are good up to 110 mph. There are 23 level crossings between New Haven and Hartford and another 11 between Hartford and Springfield; $30 million would upgrade them all. In Switzerland, schedules are padded by 7% over the technical travel time, to permit trains to recover from delays. By American standards, this is a low figure: the LIRR’s schedules are padded by 20-30%, and I have personally seen an express New Haven Line train do Stamford-Grand Central in about 15% less than the scheduled trip time. Switzerland achieves high punctuality with relatively tight scheduling by making sure delays do not propagate. Railroad junctions are grade-separated when possible, and if not then they are equipped with pocket tracks to allow trains to wait without delaying crossing traffic. To achieve comparable reliability, Metro-North should grade-separate its most important junctions: Shell, where the line joins with the Northeast Corridor tracks carrying Amtrak (and soon Penn Station Access); and Stam, where the New Canaan Branch joins. It could potentially also grade-separate Berk, where the Danbury Branch joins, and Devon, where the Waterbury Branch joins, but the traffic at these junctions is lighter and delayed branch trains can wait without disturbing mainline trains. Moreover, like the rest of Europe as well as Japan, Switzerland conducts maintenance at night. The daytime maintenance with work zones that are a common sight on American passenger railroads are unknown on most European railroads. Only mixed lines running high-speed passenger trains in the day and freight at night have to schedule trains next to active work zones, and those are indeed much harder to maintain. The laws of physics are the same on both sides of the Atlantic. If it’s possible to maintain tracks adequately during four-hour nighttime windows in Europe, it’s possible to do the same in the United States. Freight traffic on the Northeast Corridor is lighter than on many Swiss mainlines, and while passenger traffic at rush hour is very heavy, in the off-peak it is considerably lighter than on the urban commuter rail line trunks of Zurich. While four Metro-North trains run between New York and Stamford every off-peak hour, as does a single Amtrak train, ten Zurich S-Bahn trains run per hour between Zurich and Winterthur, as do six interregional and intercity trains. The importance of maintenance was underscored in a recent article describing an independent plan to drastically cut travel times through better track standards, spearheaded by Joe McGee of the Business Council of Fairfield County and authored by San Francisco consultant Ty Lin and former Metro-North president Joseph Giulietti. In response to their plan, CDOT said it was not possible—and to emphasize this fact, the article notes that an upcoming schedule revision will slow down the trains by 6 to 10 minutes due to trackwork delays. The one thing that the state must avoid is funneling any money into State of Good Repair (SOGR) programs. SOGR is a black hole permitting incompetent officials to spend capital money without anything to show for it: agencies around the country have SOGR programs decade after decade and somehow their stated maintenance backlogs never shrink. Instead, 30-30-30 is the closest thing to a true program for what SOGR is supposed to be. Were the tracks in good shape, and were speeds on curves in line with modern railroading practices in other developed countries, express trains would take exactly half an hour to travel between Grand Central and Stamford and between Stamford and New Haven. So 30-30-30 is really setting a standard for a program that, up until now, has only served as an excuse for CDOT to do nothing. It’s not yet clear what CDOT and Metro-North’s reaction to 30-30-30 will be. Is the governor’s goal achievable? Absolutely, give or take a few minutes. Is it achievable on a reasonable budget? Definitely. Are the managers who have let train schedules slip over the years, as their counterparts in New York have, capable of running the trains punctually enough in order to meet the timetable? That is the big question mark. I’m sitting on a train heading to Germany, about to depart Paris. I’m less comfortable writing about myself than some other urbanists I admire like Alex Baca and Kristen Jeffers, but I will still try to explain. I didn’t intend to live here long-term. As I said two years ago, I moved here for the universities, and stayed even after I left academia, and even as I stayed, I didn’t know it would be for such a long period of time. I kept renting on three-month cycles because with my self-employment and variable income landlords wouldn’t rent to me on an annual contract. Many of the renewals were uncertain, depending on various circumstances like whether I would hear from NYU about grants. But this turned into my longest stint living in the same apartment in my adult life: two years and three months. And now it’s ending. I spent 2017 building my professional life, sending pitches to anyone I could find an email for. I knew I was in an expensive city, but even then, I looked at housing costs elsewhere and didn’t think I’d even save money net of moving expenses. I still don’t; I don’t expect my living expenses to fall in Berlin once you add mandatory health insurance to rent. This is not why I’m leaving. Rather, the situation in 2018 got to the point that I needed to ask myself where I really wanted to live. The rule was, anywhere in the EU or where EU citizens could live freely, like Norway. In July I visited London, which was an option depending on how EU migrant rights would be treated under Brexit, but between high rents and trademark Theresa May hostile environment rules in the Brexit deal, it wasn’t so attractive. For a while, I really did like it here. I saw things that I never got to see in the United States or in Sweden: at the nearby high school, as well as at Bois de Vincennes, white and Arab and black children were playing together. Eastern Paris is the kind of integrated neighborhood that, in North America, everyone pretends to want to build and yet nobody seems capable of building. I knew about the diesel pollution from my first winter here, but things seemed to be getting better, with a steady decrease in the proportion of cars powered by diesels, Anne Hidalgo’s pedestrianization of streets and city squares, and the Macron cabinet’s hike in taxes on fuel. My best recollection is that the pollution was less bad in the winter of 2017-8 than in 2016-7, and I took it at a sign things were getting better. Macron is not a popular president. Polls consistently put his approval rate in the 30s, even as, as the median French politician on the main issues, he was and still is handily winning reelection against the cadre of sacrificial lambs offered by the parties on the left and right. Previous protest movements concerned labor issues, sometimes winning, as when they defeated his 2017 labor law reforms (since passed in a weaker form last year), and sometimes losing, as when the railway workers struck to fight the SNCF governance reforms. And then came the Gilets Jaunes, so-called because of the mandatory reflective yellow vests within cars. Their initial grievances were the diesel taxes and the reduction in the speed limit on non-motorway roads from 90 km/h to 80. The taxes were no more popular than any other tax hike, and they got sympathy early, protesting in the usual French way of blocking roads. Even then, in late November, there were signs they were nastier than the usual. CRIF warned about anti-Semitism at the protests; SOS Racism warned about harassment of immigrants. White Christian France did not listen. Then the Gilets Jaunes escalated to rioting, and even as the public grew hostile to their methods, the state dithered. The political movements outside En Marche maintained their support. I never had any illusions about La France Insoumise and other far left movements, but the Green Party joined in, echoing the fake news of the extreme right about how what really matters is taxing ship fuel rather than cars. Soi-disant green protesters tried to connect their agenda to that of the Gilets Jaunes, saying “the fight for the climate and the fight for purchase power are the same.” Antifa joined in, having some internal fights with the most overtly fascist members, but not with the main of the movement, which is still about half National Front voters. Nobody saw fit to mention the racism. Politics in France is so white—Macron’s rainbow coalition has a less racially diverse cabinet than Trump, and he’s still under criticism for not being racism enough from both directions; the top far left leader, Jean-Luc Melenchon, wrote an angry blog post saying that France did not collaborate with the Nazis in WW2. The big protest, on December 8th, involved vandalism in central Paris. At Nation things were tamer. I visited briefly and saw an all-white crowd in a neighborhood where these are not the usual demographics. Two people who looked my age or slightly younger, both white, sat on a bench near the square, one taping “down with the state” on the back of the other’s jacket. Everything about that crowd screamed “hipsters going through the motions.” Eastern Paris has a lot of that, too. Elsewhere, things got a lot worse, with violent threats against foreigners, Jews, and racial minorities. Protesters vandalized stores with graffiti like “Rothschild” and “Juden,” and the reaction among supporters on Twitter was either justification and denial that the Rothschild tag was anti-Semitic, or denial that the Gilets Jaunes were the vandals. This is on top of homophobia (Gilets Jaunes protesters have demanded a referendum on repealing gay marriage) and general idiocy (they oppose mandatory vaccination). Macron did what France does best in the face of fascism: he surrendered. In overseas France he’d declared martial law, but at home, facing white people, he didn’t; he canceled the planned tax increase, and announced a host of tax cuts and pension benefit increases to try to mollify them. The difference between that and how the state treated Muslim rioters in 2005 was jarring. A single spineless leader might be survivable, but the entire political system here supports rioters provided they are white. This percolates outside the country. The alt-right is of course in full support, but the decidedly non-extreme Wall Street Journal positively spun the movement as a tax revolt. On the other side, the alt-left celebrated, since it’s always hated Macron. Pan-European anarchists like Quinn Norton celebrated the Gilets Jaunes. Alexandria Ocasio-Cortez tweeted in support of the movement, in response to a tweet saying the police was threatening to join them if the state didn’t increase cops’ pay, and nearly every American socialist I’ve interacted with since has tried to defend her in ways they never would if she’d tweeted in enthusiasm about Pinochet. The pollution will not get better, or, if it does, it will be at a glacial rate; the revocation of the diesel taxes will make sure of that. Neither will the French state’s responsiveness to the needs of the city and the people who live here, many of whom are not the grandchildren of the Milice but of its and of the French colonial army’s victims. White Europe’s public intellectuals pattern-matched the movement to a right-populist resurgence that they love to blame on neoliberalism and not on the populists’ racism. While this was going on, I was glued to AQI. There were days in December when the air here was worse than in Milan, worse than in Katowice. Germany was entirely clean. This is not just an issue of Germany having a government that feels sufficiently guilty about leading the pan-European project that was the Holocaust that it dials down the racism. Somehow, German cities manage far cleaner air than Paris, and the political system there looks forward. The Greens there fight for an open society rather than looking for excuses to protest fuel taxes. Paris keeps defining itself by global city attractions, like the Opera or the cafes or the museums. But that’s not a reason to live in a city. It’s a reason to visit for a week. Already Hidalgo is unpopular for her attempt to make the city livable, and the poster boards of Nation, once filled with communist slogans and with the face of one crank calling for Frexit, are now filled with posters complaining that the mayor is immiserating the French. If the city and the state are not going to provide basic necessities like clean air and streets that I can cross safely, I don’t really need to live here. All the programs in the world won’t keep me in a place where I do not get these basic necessities. Even before Macron, France tried to build up tech clusters, which effort has only intensified in the last two years. The state will do anything except improving the business climate and providing services like protecting foreigners from marauding hordes of vandals. The message the surrender has sent is not just that air quality will remain among Europe’s worst but also that foreigners are not really welcome here. This is not the message Macron wants to send; I get the impression he genuinely wants a more open and more globalized France. But he is unwilling to do what it takes to send the right message. In that way, he is like many ineffectual leaders in semi-democracies like Nigeria, Pakistan, and Bangladesh, where there’s no autocracy in the sense of China or Russia, just a crowd of traditionalist pogromchiks who the state either can’t or won’t stop from hacking at gays, religious minorities, or journalists who offended some local notable. I will miss Paris. I really will. Eastern Paris is delightful and supposed no-go zones like Belleville have grocery stores selling good food items that the European-owned stores don’t. It’s the supposed Real France that’s a problem, defined around closedness, monolingualism, and an ethnic hierarchy. If I’m looking for a place that’s functional enough I can expect it to not just have clean air but also deal with other social problems appropriately, I don’t have that many options. Eastern Europe is out, Mediterranean Europe not much better, France by definition not good. Ireland might be an option because they speak English there, but moving by plane is a chore and Dublin is ultimately not a large city. Scandinavia is Anglophone and has food items I’m craving at supermarkets that I can’t find anywhere in Paris, but it’s expensive and my two years there were two more than enough. I told a Twitter follower I was moving to Germany and their first question was “are you a Berlin person or a Munich person?” I of course don’t know the answer to this question, not knowing the subtleties. The Germans I know tend to be northerners; I asked a German professor in Stockholm why the Germans at KTH seem to all be northerners and was told that Scandinavia and northern Germany are similar in ways that are distinct from southern Germany. So I don’t have a basis of comparison, I just know what the rents are and which governments are in charge. Two years ago, I noticed Berlin’s cheapness, but wasn’t sure where to live, and knew the moving expenses would be high. But given that I have to undertake these moving expenses anyway, I might as well move to the cheaper city. The job market there is weak in the private sector, but since I’m not getting work at someone else’s company either way I might as well go for the cheap rents. I will of course keep blogging. I imagine I will talk more about the details of proof-of-payment systems and S-Bahn scheduling and less about driverless metro implementation, but ultimately I read trade publications and look at timetables rather than writing about my experiences taking urban rapid transit. Not much will change—expect a few days’ gap in new posts, but with my schedule of posting eight or nine times per month such gaps are routine anyway. I will just say “here” and mean Berlin and not Paris. By a more than 2-1 vote among my Patreon backers, the third installment in my series about national traditions of building urban rail is the British one, following the American and Soviet ones. While rapid transit in Britain outside London is even smaller than in the US outside New York, the British tradition is influential globally for two reasons: first, Britain invented the railway as well as urban rapid transit, and second, Britain had a vast empire much of which still looks up to it as a cultural and scientific metropole. Nonetheless, despite the fact that all rapid transit traditions technically descend from London’s, it is worthwhile talking about the British way. What London built inspired and continues to inspire other cities, but many, mainly in the United States, Japan, and Continental Europe, diverged early, forming distinct tradition. As I noted in the post about the Soviet bloc, Moscow was heavily influenced by British engineering, and its own tradition has evolved separately but began as a more orderly way of reproducing the London Underground’s structure in the 1930s. In taxonomy, this is called a paraphyletic group. Monophyly means a taxon descending from a single ancestor, for example mammals; paraphyly means a taxon descending from a single ancestor excluding certain monophyletic subgroups, for example reptiles, which exclude mammals and birds, both of which descend from the same common ancestor. Like most other things Britain became known for, like constitutional government and colonialism, rapid transit evolved gradually in London. Technically, the first railway in London, 1836’s London and Greenwich, meets the definition of urban rapid transit, as trains made some local stops, ran every 20 minutes, and were grade-separated, running on brick arches. However, it is at best an ancestor of what we think of as rapid transit, since it lacked the really frequent stops of the Underground or the New York els. The first proper rapid transit line in London, the Metropolitan line, opened in 1863. It, too, lacked some features that are standard on nearly all rapid transit systems today: most importantly, it was not self-contained, but rather had some through-service with intercity rail, and was even built dual-gauge to allow through-service with the Great Western Railway, which at the time had broad gauge. Trains ran every 10 minutes, using steam locomotives; to limit the extent of smoke in the tunnels, the line was not fully underground but had a long trench between King’s Cross and Farringdon. The Met line and the second Underground line, 1868’s District line, were both built cut-and-cover. However, whereas Met line construction went smoothly, the District line had to carve a right-of-way, as the city did not have adequate wide streets for serving the proposed route. The areas served, Kensington and Chelsea, were even then a tony neighborhood with expensive real estate, and the construction costs exploded due to land acquisition. In today’s terms the Met line cost about $32 million per kilometer and the District $90 million, a record that among the historical lines I know of remained unbroken until New York built the Independent Subway System in the 1930s. The Met and District met to form a circle, and in general, London loved building circular lines. In addition to what would be called the Circle line until a revision last decade, there were two circles farther out, called the Middle Circle and Outer Circle. These were run by mainline railroads; there was still no legal distinction between the two urban railroads and the mainlines, and through-service and even some freight service continued on the Met well into the 20th century, which the company used as an excuse to delay its merger with the other Underground companies. Even electric rapid transit took time to take shape. After the bad experience with the District line, there was no more cut-and-cover in Central London. The next line to open, 1890’s Northern line, required the invention of deep boring and electric traction; it was not the first rail line to use electricity, but was the first excluding streetcars. However, while the line looked like a normal self-contained rapid transit line, it was pulled by electric locomotives; electric multiple units only came a few years later, starting haphazardly in Liverpool in 1893 (each car required separate controls) and in the more conventional way on the Chicago L in 1897. Among the inventions that came out of London was the radial network design. Unlike the physical inventions like underground rail and electric traction, this was not a deliberate choice. It evolved through spontaneous order, owing to the privately-funded nature of British railways. A British railway had to obtain the approval of Parliament to begin construction, which approval would also permit compulsory purchase of land along the way, but funding was entirely private. An early proposal for an underground railway, an 1860s route running what would later become the Charing Cross branch of the Northern line, was approved but could not secure funding and thus was not built. The upshot is that with private planning, only the strongest lines were built. The strongest travel demand was to the center of London, and thus the lines were all radial, serving either the City of London or the West End. There was no circumferential service. While there were many circles and loops, these were conceived as reverse-branches allowing some railroads to access multiple Central London terminals, or as ways to join two radials like the Met and District without having to go through the difficult process of turning a train underground in a world in which all trains had to be pulled by locomotives. The same preponderance of radial lines can be seen in other privately-planned contexts. Today, the best-known example is the matatu network of Nairobi. It is informal transit, but has been painstakingly mapped by urbanists, and the network is entirely radial, with all lines serving city center, where the jobs requiring commuting are. Despite the private planning, London has only a handful of missed connections between lines: it has eight, but only one, between the Met line and the Charing Cross branch of the Northern line, is a true miss between two lines – the other seven are between parallel outer branches or between two lines that intersect a few times in close succession but only have one transfer (namely, the Bakerloo and Met). This is not because private planners build connections spontaneously – Parliament occasionally demanded some minor route changes, including interchange stations at intersections. Like rapid transit, regional rail evolved in London in a haphazard fashion. The London and Greenwich was a mainline railway and the Met line had some mainline through-service, and even the deep-level tube lines are compatible enough with mainline rail that there is some track-sharing, namely between the Bakerloo line and the Watford DC line. The trench between King’s Cross and Farringon was widened to four tracks and turned into a north-south through-route in the 1870s but then abandoned in the 1920s and only reactivated in the 1980s as Thameslink. The upshot is that London ended with the bones of a regional rail network but no actual service. The ideal was self-contained Underground lines, so even when connections suggested themselves they were not pursued. For example, the original proposal for an underground line between Euston and Charing Cross involved some through-service to the railways at both ends, but when the line was finally built as the Charing Cross branch of the Northern line it was not connected to the mainline and only took over minor branches in suburban North London. While British planners did eventually plan for through-service – plans for Crossrail date to World War Two or just afterward – by then London was not innovating but rather imitating. By the war, Berlin had already had two S-Bahn through-lines, Munich was planning one, and Tokyo had three. The modern design for Crossrail is best compared with the RER A, in a city London has treated as its primary competitor for a long time now. Moscow was heavily influenced by London early on. Later on, Singapore and Hong Kong both drew on British engineering expertise. London’s status as the first city to build rapid transit may have influenced Moscow, but by the 1920s New York had surpassed it in city size as well as urban rail ridership. Moscow’s drawing on London was as I understand it accidental – the chief engineer happened to have London connections – but in Singapore, Hong Kong, Australia, and so on the relationship is colonial, with extensive cultural cringe. In all of these non-British cities, the British design as exported was cleaner. What I mean is, the systems have a radial structure like London, but the radii are cleaner in that two lines will generally cross just once, especially in Moscow; it’s not like London, where the Central line is always north of the District line, meeting once in a tangent at Bank and Monument, or where the Victoria line and Northern line cross twice. Another cleaner aspect is the transfer experience. Singapore and Hong Kong both make extensive use of cross-platform transfers between otherwise perpendicular lines; London only does sporadically, on the Victoria line. A third aspect is uniformly wide interstations. London’s average interstation is about 1.25 km, which is what I think of as the standard because it is very close to the average in Tokyo and Mexico City as well, and at the time I started tracking this statistic in the late 2000s, the Chinese systems were still small. Moscow’s average is 1.7 km, and Singapore’s is similar. Hong Kong is actually divergent there: the MTR mixes core urban lines averaging about the same as in London with the more widely-spaced historically mainline East and West Rail lines and the airport express. The relative paucity of circumferential rail is hard to judge in the export cases. Moscow came up with the idea for the Circle Line natively; there is an urban legend that it was accidentally invented by Stalin when he left a coffee cup on the map and it stained it in the shape of a circle. Hong Kong doesn’t have much circumferential rail, but its geography is uniquely bad for such service, even more so than New York’s. Singapore does have a Circle Line, but it’s one of the two worst-designed parts of the MRT, with a reverse-branch (the other one is the self-intersecting, connection-missing Downtown Line). At the same time, it’s worth viewing which aspects British-influenced systems are getting rid of when designing cleaner version of the Underground. The most important is regional rail. Singapore has none: it has a legacy narrow-gauge rail line to Malaysia, but has never made an effort to take control of it and develop it as an urban regional rail line. Another negative aspect exported by London is the preponderance of deep boring. I made the same complaint when discussing the Soviet bloc: while London is poor in wide arterials that a cut-and-cover subway could go underneath, Moscow is rich in them, and the same is true of Singapore. London invented rapid transit as we know it, but it did so gradually and with many seams. In some sense, asking if this works is like asking if rapid transit as a technology works, for which the answer is that it is a resounding success. But when it comes to the details, it’s often the case that London has accidental successes as well as accidental mistakes. In particular, the fact that London almost invented regional rail is a source of endless frustration and extensive retro-crayon. The Met line is almost a 19th-century Crossrail, the Widened Lines are almost a 19th-century Thameslink, and so on. Instead, as time went on the trend has been toward more self-contained lines, which is good for reliability but not when there are self-contained slow tracks of mainlines to hook into, as is planned for Crossrail and as has sporadically been the case for the Watford DC line. The British focus on radial systems has generally been good. To the extent London has underused metro lines, it’s not because they are poorly-routed as some of the lines in Paris are, but because they serve areas that have many urban rail lines and not a lot of population density; London is not a dense city, going back to the Victorian era, when it standardized on the rowhouse as the respectable urban housing form rather than the mid-rise apartment of Continental Europe or New York. To the credit of British-influenced planning, Singapore has managed to fit a circumferential line into its system with good connections, just with an awkward reverse-branch. London’s own circumferential transit, that is the Overground, misses a large number of Underground connections due to its separate origin in freight bypasses and mainline rail reverse-branches, where Parliament saw no point in requiring interchange stations the way it did on the Tube. However, the cleaner version seen in Singapore only misses connections involving the Downtown Line, not the Circle Line. What is perhaps the worst problem with the British style of design is the construction cost. The Northern line was not expensive – in today’s terms it cost around $35 million per km, give or take. However, after WW2 a gap opened between the cost of cut-and-cover and bored metros. The Milan method for cut-and-cover built a subway for around $45 million per km a few years before London bored the Victoria Line for $110 million. Britain exported its more expensive method, which must be treated as one factor behind high construction costs in Singapore, Hong Kong, Australia, and New Zealand; in New Zealand the regional rail tunnel is expensive even as electrifying the system was not. In the future, cities that wish to build urban rail would be wise to learn from the network design pioneered by London. Urban rail should serve city centers, with transfers – and as in the subsequent refinements of cities that adapted London’s methods to their own needs, there should be some circumferential transit as well. But if mainlines are available, it would be wise to use them and run trains through on the local tracks where available. Moreover, it would be unwise to conduct deep boring under wide streets; elevated or cut-and-cover construction is well-suited for such avenues, causing some street disruption but producing considerable less expensive lines.